How do you create a one to many relationship using SQL Server? This means that Table A can have one or more records relating to a single record in Table B. This is a simple example of a classic Order example. Each Customer can have multiple Orders, and each Order can consist of multiple OrderLines. In this diagram, there are actual foreign key constraints. They are optional, but they ensure integrity of your data. Also, they make the structure of your database clearer to anyone using it. I assume you know how to create the tables themselves. Then you just need to define the relationships between them. You can of course define constraints in T-SQL (as posted by several people), but they're also easily added using the designer. 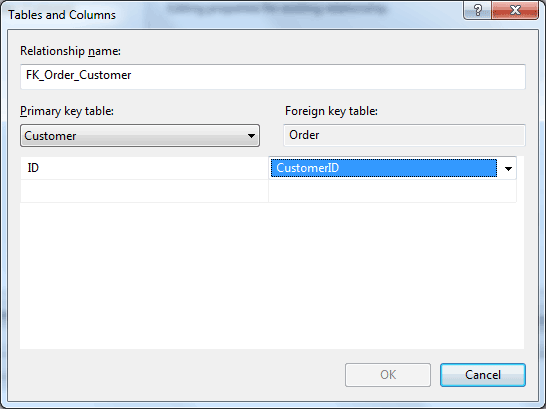 Using SQL Management Studio, you can right-click the Order table, click Design (I think it may be called Edit under 2005). Then anywhere in the window that opens right-click and select Relationships. The Order table should already be selected on the right. Select the Customer table on the left dropdown. Then in the left grid, select the ID column. In the right grid, select the CustomerID column. Close the dialog, and the next. Press Ctrl+S to save. Having this constraint will ensure that no Order records can exist without an accompanying Customer record. To effectively query a database like this, you might want to read up on JOINs. This is how I usually do it (sql server). --The INSERT statement conflicted with the FOREIGN KEY constraint "FK__Detail__MasterID__0C70CFB4". --The conflict occurred in database "Play", table "dbo.Master", column 'MasterID'. --The statement has been terminated. As you can see the second insert into the detail fails because of the foreign key. Here's a good weblink that shows various syntax for defining FK during table creation or after. If you are talking about two kinds of enitities, say teachers and students, you would create two tables for each and a third one to store the relationship. This third table can have two columns, say teacherID and StudentId. If this is not what you are looking for, please elaborate your question. Can There be a Table in a Relational Database that Doesn't Have a Relationship to Any Other Table?